The exclusive bedding set can be ordered additionally to SmartGrow 7in1 with bed set or it can be used for the SmartGrow 7in1 without bedding set. The 12x pillow-nest makes the bed look really cozy, and protects the baby from brightness and air-draft. The nest can be formed by tying together the sashes attached to the pillows. 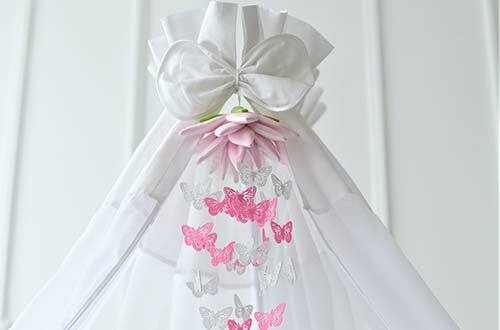 The canopy comes also together with a bow for a cute look. Welcome your baby ComfortBaby’s exclusive bedding set for a great start in its own bed.